By far, the most heavily studied class of animals, birds offer much insight into changing environmental conditions (such as those influenced by climate change), based upon changing migration patterns, and their ability to quickly move from one area to another. This album features any bird species which wouldn’t be described as a raptor, water bird, or hummingbird. Therefore, one will encounter many (but not entirely) of the smaller birds of the world, especially songbirds. Female phainopepla spreading her tail feathers. These interesting birds will actually lay two egg clutches a year; once in the higher elevations, and once in the lower. Picture Rocks, AZ. Goldfinch on a millet stalk. They love to forage the seeds. I'm quite taken by the simplistic appearance of this shot. Photographed in Michaux State Forest, PA, USA. Goldfinches, dispersed amongst the pasture thistles. They seemed to be quite fond of the seeds! Photographed in Michaux State Forest, PA, USA. Hcence their name, Cactus wrens choose the most sinister, yet well-protected nesting sites imaginable. The cactus spines provide an incredible defense from predators! Photographed at Rockhound State Park, NM, USA. Can you venture a guess at why it's called a scaled quail? This beautiful fellow and his mate walked right by my camping site, presenting this excellent photo op! Photographed at Rockhound State Park, NM, USA. While watching and snapping pictures of this blue-gray gnatcatcher, I had no idea why it kept hopping closer and closer, until a gnat flew into my eye. I then suddenly realized that I had brought a smorgasbord of buggy snacks. Photo taken near Richmond, VA, USA. Vermilion flycatchers specialize in catching flying insects "on the wing," often returning to the same favored perch sites. Tucson, AZ. A close-up “profile” shot of the beautiful American Tree Swallow. Already a lovely bird, the bright sunshine really helped to intensify its gorgeous coloration. Photo taken at John Heinz National Wildlife Refuge, PA, USA. To many a creature this size, a large cherry would fit the expression of "biting off more than you can chew," but cedar waxwings are well adapted to stuffing their faces with berries. Photographed near Selinsgrove, PA, USA. A fan favorite, this shot was taken at the edge of a cow pasture, in late autumn. I love the color scheme, as well as the old wire, meeting the new. Photographed in Winfield, PA, USA. 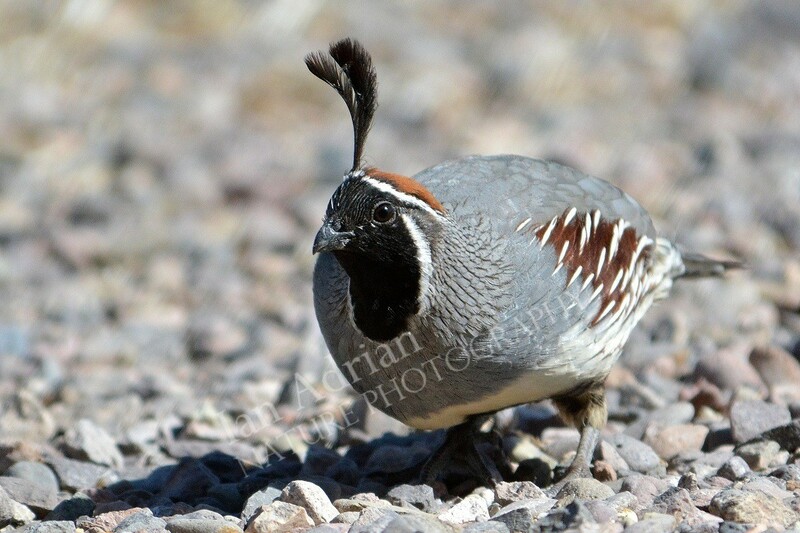 I love the expression on this quail's face! These chubby little birds are incredibly entertaining. The males like to find an elevated perch from which to make the silliest squeal one could imagine. Photographed at Caballo Lake State Park, NM, USA. Named for the golden-yellow robes of the early Roman prothonotaries, these beautiful warblers spend their days foraging and defending brushy territory, often bordered by water. Prothonotary Warbler photographed in Okefenokee NWR, GA, USA. Named after the golden-yellow robes the early Roman prothonotaries used to wear, these beautiful warblers spend their days foraging and defending brushy territory, often bordered by water. Prothonotary Warbler photographed in Okefenokee NWR, GA, USA.